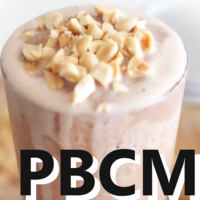 A bold and smooth Peanut Butter Milkshake profile. Nutty, Creamy, Thick! Koolada and Saline are optional. This recipe is the property of SteamOn and released under the CC Attribution-NonCommercial-Sharealike 4.0 license. You may not copy, derive or commercialize this recipe without following the terms of this license or the explicit permission of the creator. Loved this. Its great. Very thick, creamy vape. Great PB taste. Custard and creams are balanced. You can taste the thick shake. Great job!